To the Internet reader: This page is self-explanatory. 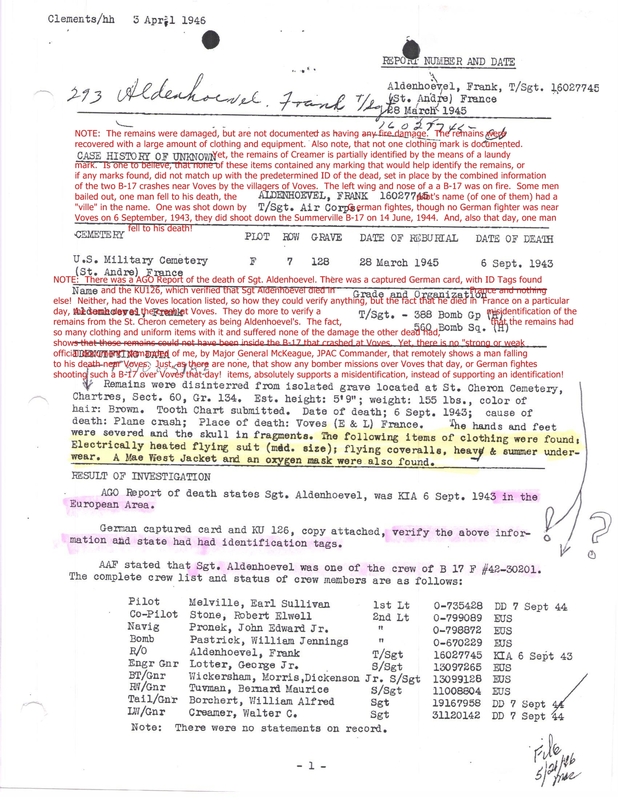 Note: The MACR 5800 B-17G crashed 9 months after the Mohr B-17F crashed at Voves, just 1.6 miles from the Mohr crash site, misidentified as the Melville crash site. Three items contained in the internal documentation of MACR5800, prove a misidentification took place. When the B-17G covered under MACR5800 crashed, the damage it suffered basically matched the known damage theMelville B-17F had suffered, when last seen. The left wing was on fire and the nose was one fire, one man had fallen to his dead and one man was taken to the Voves village hall. In addition, the pilot’s name, Summerville, had a “ville”at the end, which he shared with Mel”ville.” who had died 261 miles to the east. Thus, began the misidentification based on the last part of a pilot’s name, a man falling to his death, a man being taken to the village hall and a crash site with an equal number of dead! Problems with the original (mis)identification? Can anyone explain to me, one fact? In every IDPF, (Known or Unknown) that I have seen over the years, including one in this situation, many have included some sort of clothing identification number. Yet, in this one situation, the man who fell to his death, with all the items recorded as being located with his remains, there is no number recorded? With all that equipment and clothing, not one recordable ID mark? My educated guess has to be, none found on any of the items matched the number required to prove it was Aldenhoevel! Though, one such number was recorded with the burnt pile of human remains, (falsely) positively identified as Sgt. Creamer, based on a dental chart with errors and one such number. A number, easily explained, as to why the true person those remains represented, could have been wearing that item of someone else’s clothing on that mission.